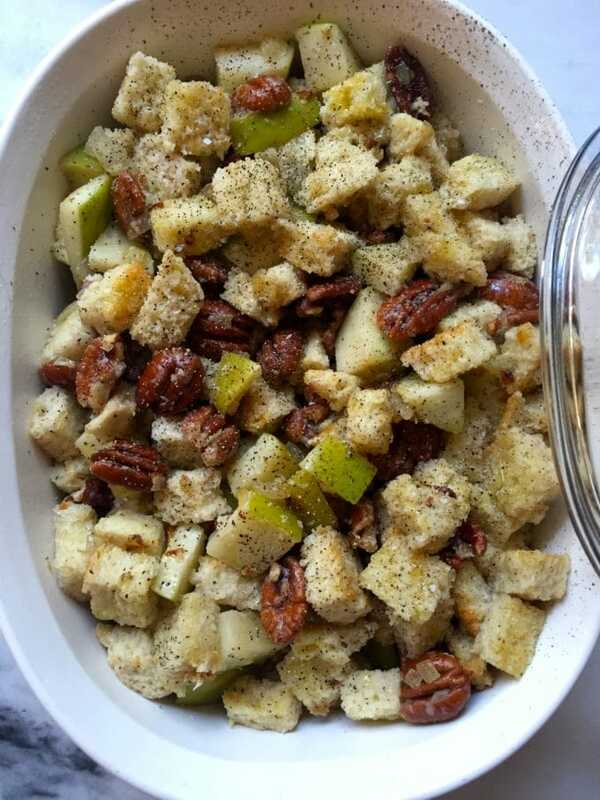 If you want to shake things up just a bit this Thanksgiving and try something new, this delicious Sourdough Bread with Apple and Pecan Dressing side dish should be given serious consideration. 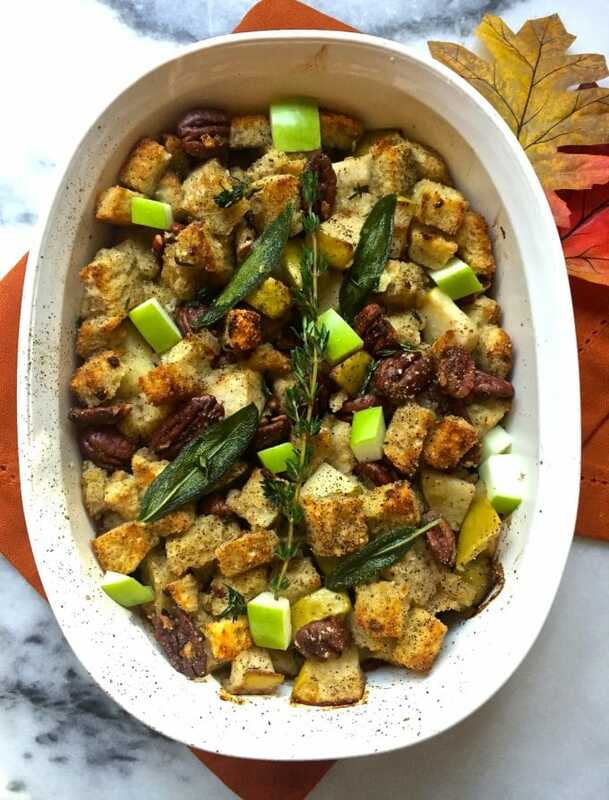 This yummy Thanksgiving dressing is a delicious marriage of toasted tangy sourdough bread, tart apples, toasted pecans and fresh herbs, and you will love it. 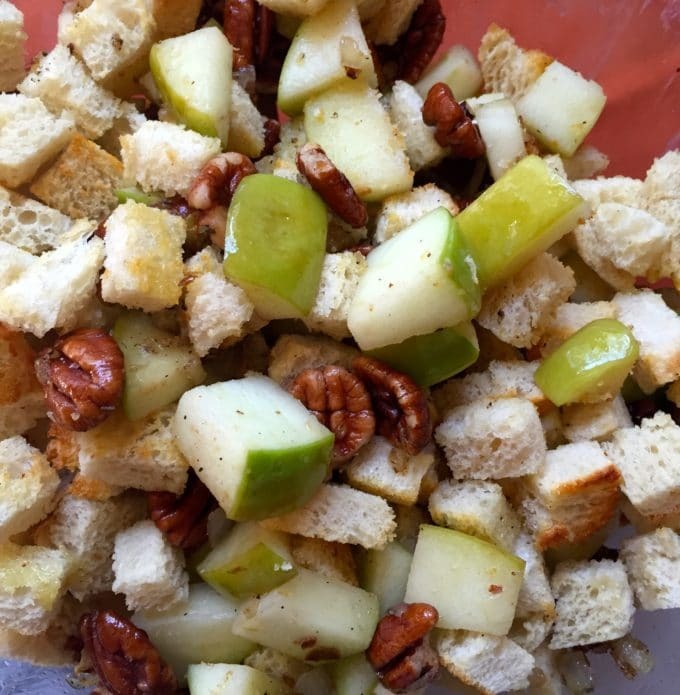 Sourdough Bread, Apple, and Pecan Dressing only takes minutes to prepare and can be made the day before. Oh, my goodness, it’s only 17 days to Thanksgiving, and I have been cooking up a storm! I want to give you lots of choices for easy to make side dishes and desserts, most of which you can make ahead so that you can have a stress-free Thanksgiving. Oh, and don’t forget the star of the show, turkey. I have a mouth-watering Herb and Garlic Smoked Turkey recipe that I think you will love. And, how about a Skillet Thanksgiving Dinner for Two, featuring what else, turkey, sweet potatoes, and cranberries that believe it or not, you can have on the table in less than an hour. In addition to my recipe posts, I will also be posting Thanksgiving recipe roundups with even more great recipes from some of the top bloggers in the country. So, instead, of my usual three posts per week, you will see a new post almost every day up to Thanksgiving. If you haven’t already, be sure to check out 15 Spectacular Sweet Potato Recipes which features both sweet and savory sweet potato classics, as well as new twists on old favorites. And, if by chance you are not already a subscriber to my blog, be sure to subscribe today, so you will receive these new posts just as soon as they are posted. Stress-Free Thanksgiving Tip # 3: If you are cooking for a crowd, let everyone bring a dish. Thanksgiving is all about sharing our bounty and everyone will be a star. 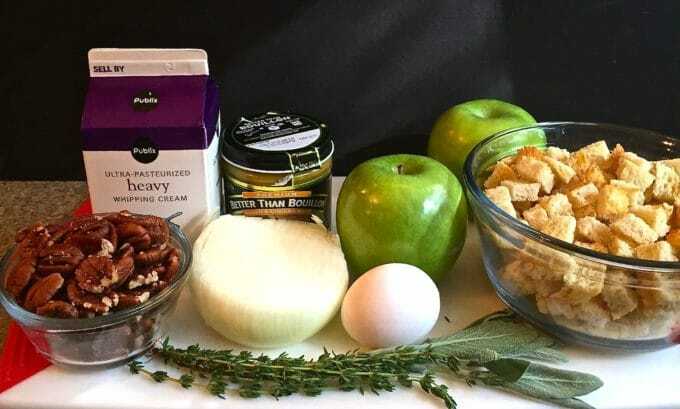 The ingredients for Sourdough Bread, Apple & Pecan Dressing include sourdough bread, olive oil, garlic, fresh sage and thyme, onion, Granny Smith apples, pecans, eggs, heavy cream, chicken stock and Kosher salt and pepper. 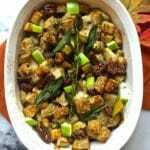 To make this delicious Thanksgiving side dish, gather your ingredients and preheat oven to 400 degrees F.
Place bread cubes on a baking sheet and bake for 8-10 minutes or until the bread is lightly toasted. Set aside. Heat a large skillet over medium heat. Add olive oil, garlic, sage, and thyme. Cook for 2-3 minutes to infuse the oil with flavor. Remove the sage leaves and set aside on a paper towel. 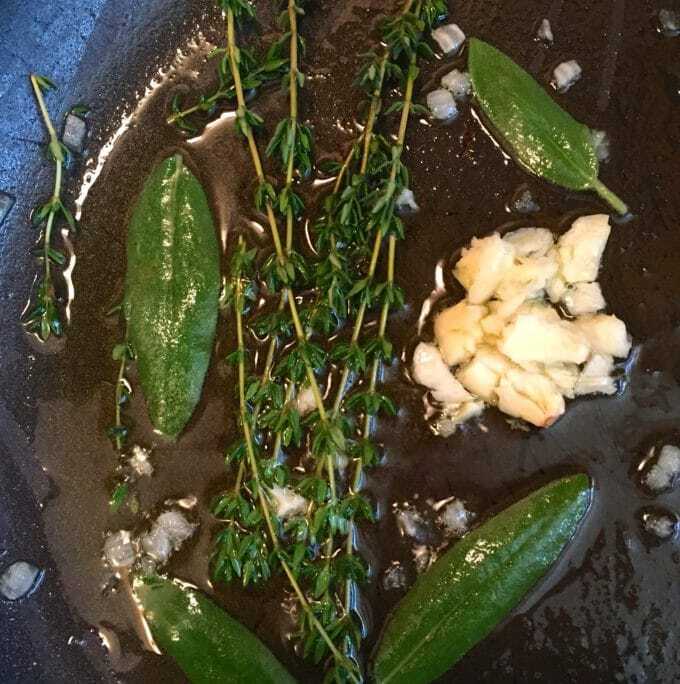 Discard the garlic and thyme sprigs. Add the onions to the pan and reduce the heat to medium-low. Cook the onions about 15 minutes or until they are caramelized. Season with salt and pepper. Remove the onions from the pan and set aside. Add the apples and pecans to the pan. Stir frequently and cook for about 4-5 minutes or until the pecans are lightly toasted, and the apples have softened a bit. Add the egg, cream, and chicken stock to a large bowl and whisk until combined. Add the onions, apples, pecans and bread cubes. Mix well. Uncover the dish and continue baking an additional 15 minutes or until the top is golden brown and crusty. Let stand 10 minutes and sprinkle with the cooked sage leaves. Looking for more Thanksgiving recipes? Check these out. 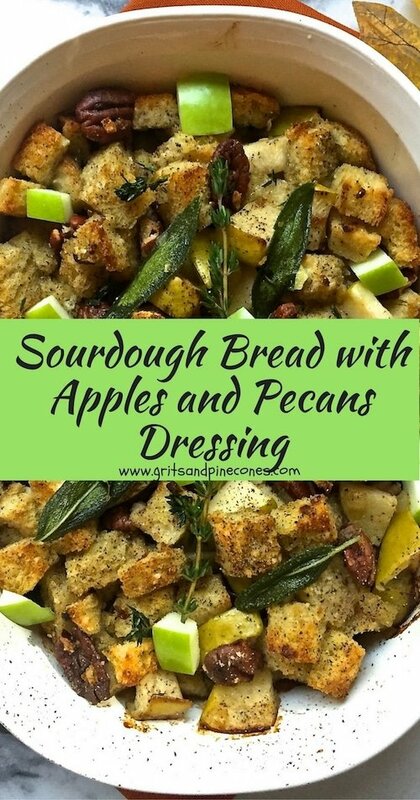 Delicious Sourdough Bread with Apple and Pecan Dressing takes minutes to make, contains toasted tangy sourdough bread, tart apples, toasted pecans, and herbs. Heat a large skillet over medium heat. Add olive oil, garlic, sage and thyme. Cook for 2-3 minutes to infuse the oil with flavor. Remove the sage leaves and set aside on a paper towel. Discard the garlic and thyme sprigs. 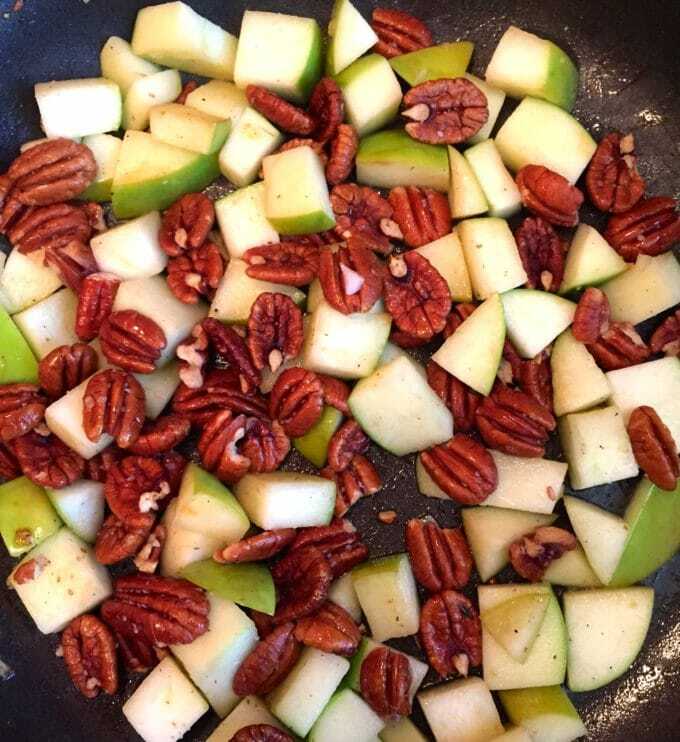 Add the apples and pecans to the pan. Stir frequently and cook for about 4-5 minutes or until the pecans are lightly toasted, and the apples have softened just a bit. Lightly grease a 2-quart baking dish and add the dressing. Drizzle a little extra virgin olive oil over the top, sprinkle lightly with kosher salt and pepper, and bake covered 20 minutes. Uncover the dish and continue baking an additional 15 minutes or until the top is golden brown and crusty. Let stand 10 minutes and sprinkle with the cooked sage leaves. 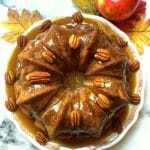 Looking for a great Thanksgiving dessert? 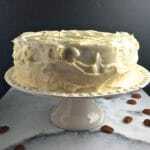 Why not try my Apple Dapple Cake with Caramel Icing or My Favorite Carrot Cake? Either one would be delicious, both are easy to make and you can make both ahead.